I have just converted my delta to use the smart effector on a 12V ramps board. Using Haydn's magball arms. Everything works just fine. BUT noticed that the hotend fan was very quiet compared to what it was before and when printing I got filament stuck in the bowden tube. When I got the filament out it was swollen due to heat. Started investigating why. First I thought the fan was broken and not spinning like it should. But when connected to a 12v power supply it spun up and ran just fine. Mounted the fan again, and during this i noticed that when attaching the magball arms on the corner with the fan connectors, the fan reduced speed again. Took one arm off and the fan spun up again. Turned the magball arm around to switch polarity and this time the fan did not reduce speed. Now i can print again without filament jam in the bowden tube. I don't know the explanation for this, but I'm sure someone here does. I have heard of strong magnets in Haydn's arms causing fans to slow down or even stop (not from users of our smart effector); but we've not seen this in our testing, using the standard E3D heatsink fan oriented as in our assembly instructions. Are you using a different fan? No, it is the original E3D heatsink fan. Smart effector also mounted with part cooling fan. All mounted by the wiki instructions. I've not experienced this with my E3D hot end fan (on a Chimera) but I did experience it on my little tiny part cooling fans that came with my printer. I replaced with a much more powerful squirrel cage fan. Design a ducting system and a more powerful fan that's farther way. (Maybe?) mount a more powerful fan in place of the standard E3D fan which can overcome the magnetic effects. I had this exact thing happen to me over the night and about a 1/3 of the way through a 2+ day print. Working on a new mount to lower and push the fan out 10mm in both directions. But, because I also used the fan mounts to hold my part cooling fans, I get to redesign the entire thing. Another . Unfortunately, for me, when I made my rod ends using the same magnets that Haydn uses, I put all of the magnets in the same orientation. Flipping the rods won't work for me. I've had this problem with other effectors and Haydns magnet's and other magnet systems, fans can struggle to overcome the magnetic fields around them, or stop turning at lower PWM settings. With the smart effector my part fans are far enough away from the magnets that this is not a problem, and I moved my hotend fan out from the hotend by extending the fan shroud around 10mm as the more powerful sunon fan was interfering with the strain gauge. I suggest trying to locate the fans a bit further away from the magnets and strain gauge, it does not have to be too far the magnetic force drops off with distance to the fourth power! If you fit Hadyn's arms with alternating N-S poles then they feel right, and I think the magnetic field will be less strong below the effector because the field wants to go straight from each ball stud to the adjacent one. Turned the magball arm around to switch polarity and this time the fan did not reduce speed. I'm just testing a new carriage/effector setup using Haydn's rods and magballs on my T3P3 Kossel Mini. This is not the Smart Effector. One of my fans is exhibiting this problem. I don't see any markings on Haydn's rods. I just flipped one of my rods closest to the impacted fan and now it seems to be working fine. Should I look to any additional shielding? Haydn labels each rod with its length, and on mine at least the label is always on the same pole. So I alternate the labels top and bottom end of the rods. But it's easy to tell even without the labels, because if you alternate the poles then adjacent rod ends will attract each other. Flipping the rods helped, but due to the effector layout, when the effector moves around the print area, the magnets get even closer to the fans, and the fans sometime stop. I think I'll try some copper strips wrapped around the magnets on the rods. If that doesn't work, I'll probably have to try some MyMetal, or give up and try a different effector, which would make me sad, because I searched for a long time, test printed a few, and really like this effector. What types of fans are you using, and where have you mounted them? Most users of the Smart Effector do not experience these issues. I've got a link to a photo of the effector in the message above. The fans are 30mm fans, and are much closer to the magnets than they would be with the Smart Effector. My initial plan was to use the Smart Effector, but determined that it would reduce print area quite a bit on the Kossel Mini. This effector raises the hot-end about 3/4's of the way above the effector. Here's the Thingiverse link to the main model, plus the modified version for Haydn's magball version, which I am using. With my DELTA SMART EFFECTOR I just had the same thing getting a brand new 24v 40mm part cooling fan installed per the instructions with the fan mounting 3d parts as provided. Every time I got the fan within 5mm of the mounting position the fan quits. I swapped one rod end for end per Carsten and the issue went away. Tested fan off the printer with a 8mm strong magnet and I could stop the fan from 19mm away if I placed it in just the right location. The 2 wire fan I used in the past seemed immune it died I suspect from the magnetic field effect but don't know I tried it with a bench power supply and it was a done. I don't have any others to test right now. This is a 40mm 3 wire fan with only the power leads attached. Just turned the rod around above the hot end fan and it stopped it dead put it back and it is running fine. I believe I have had this problem early on with the Delta Effector I had several prints ruined by the hot end fan stopping mid print. I think i just got lucky when i put it together last since it has been a long time back to my last filament feed failure. Thankfully that hot-end fan is pretty loud so i can hear if it quits. I t would be nice if Escher or who ever created the original part cooling design would create something using a 50mm blower instead of a fan. The blower is much more efficient and quieter at the required speeds. 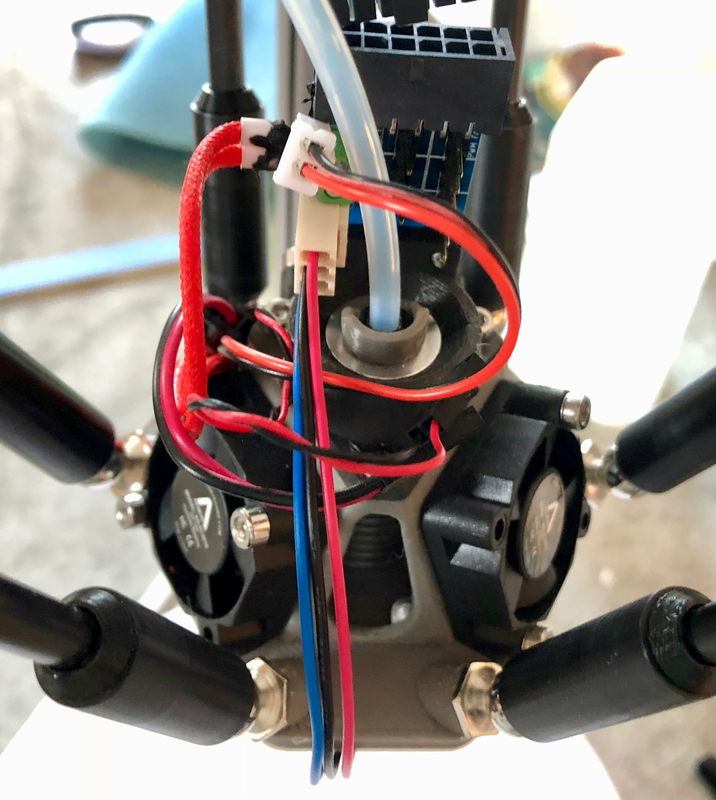 I have looked at it several times and it seems like either I lose a significant amount of print area or I need to design a very convoluted path to put the blower above the effector. I t would be nice if Escher or who ever created the original part cooling design would create something using a 50mm blower instead of a fan. The blower is much more efficient and quieter at the required speeds. A number of others have published designs for mounting a blower on the Smart Effector, and they are easily found using a search engine.